It is the time to file income tax returns, and people are all worried about their Aadhaar cards. Hey, wait! Why Aadhaar for tax filing? From this year, the income tax department has introduced an option where we can link our Aadhaar number with our PAN. By doing this, we can instantaneously e-verify our returns without having to print out the ITR-V, sign and send it by post. Wait, there's a small problem here. For the PAN-Aadhaar linking to work, the details on your Aadhaar card should EXACTLY match with what is in the PAN database. For many of us, these do not match. One simple reason for this is at many places, people manning Aadhaar counters have entered citizens names with initials (e.g. SANTOSH H). Whereas, in PAN, most of us have the longer name where the initials are expanded (e.g. SANTOSH HOSPET). This difference, however simple it might seem to us, is reason enough for the PAN-Aadhaar linking to be rejected. 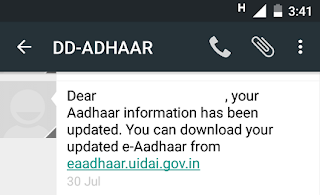 There are two options: one, get your PAN details corrected (more on that some other time) or two, update Aadhaar data. The interesting thing is, getting Aadhaar data updated is very easy. And it does not even involve visiting some office with a bunch of documents! Yes, you can use the services of 'Aadhaar Self Service Update Portal' to get your Aadhaar data corrected - even without having to leave the comfort of your chair. To update the data, visit this site and enter your Aadhaar number. Enter the captcha code, and request OTP (have patience, since this can take a while sometimes). Please note: your phone number should be updated in Aadhaar database (if not, you can not use the online option and will have to depend on the offline method - more on that some other time). Once you receive the OTP on your mobile, enter the same and login. Here, you will be asked to select field/s which you want to update/correct. You can update Name, Gender, Date of Birth, Address and Mobile Number using this interface. Once you choose the field/s and make the necessary corrections, you just have to update scanned copies of supporting document/s (list here). Once this is done, you also get a chance to choose the service provider your request goes to. Choose the one with a better response rate, and voila, you are done! If everything is in order, your details would be updated and communication sent via SMS in the next few days. You can also track the progress using the request number that is provided when you submit the request. Once it is done, you can go back to the Income Tax efiling website to link your PAN with Aadhaar (Profile Settings > Aadhaar Linked to PAN). After the linking, there's no longer a need to send the tax returns acknowledgement by post - you can instantaneously verify it and get the acknowledgement! Use this link to shop on Flipkart! Hi, I had updated my aadhar surname by aadhar card update online and done aadhar card verification also now I want to do aadhar card link to PAN. can anyone suggest me how to do?